Keep track of your insurance coverage by downloading a pocket-sized summary of the table below. *Make sure to unclick "Fit to page" when printing, so you get a summary that can fit in your wallet! Travel Accident Insurance If you suffer a loss as a result of an accidental bodily injury while occupying a common carrier, then you are eligible for this coverage. Car Rental Insurance If your rental vehicle is damaged or stolen while rented out in your name, you are covered up to the vehicle’s actual cash value plus valid loss of use charges. Purchase Security Automatically protects new purchases by insuring them for 90 days from the date of purchase in the event of loss, theft or damage. Extended Warranty Either doubles the length of the item’s manufacturer’s warranty coverage or extends it by 1 year—whichever is lesser. Trip Cancellation If you have to cancel your trip before it has even started, your prepaid travel costs will be covered up to a maximum amount if the cause of cancellation is eligible for the insurance. Price Protection If, within a certain amount of time of purchasing an item, its price drops or you find an identical item offered for a lower retail price than what you paid, you will be reimbursed for the difference. Trip Interruption & Delay If your trip has to be cut short or is delayed after the scheduled departure date, you will be covered up to a maximum amount if the cause of interruption or delay is eligible for the insurance. Flight Delay If your departing flight is delayed by a certain number of hours, you will be reimbursed up to a certain amount for necessary and reasonable expenses incurred during the delay. Travel Medical Emergency In the event that you require urgent medical care while on a trip outside of your home province, you will be covered for any eligible medical expenses incurred. Lost Baggage In the event that your checked baggage cannot be located by a common carrier, you will be reimbursed for a portion of the replacement cost of lost personal property. Delayed Baggage If your checked baggage is not delivered within a specified time frame from the time of your arrival at your destination, you will be reimbursed for the cost to replace essential items. Hotel/Motel Burglary If, while you are checked in, your personal property is stolen from your hotel/motel room and there is evidence of forceful entry, you will be reimbursed for the stolen property up to a certain amount. If you, your spouse, or your dependent child sustains an accidental bodily injury while occupying a common carrier—or while at the airport, terminal, or station at the beginning/end of your trip—and as a result suffers any of the losses below within one yearof the accident, then you are eligible for the corresponding benefit amount. 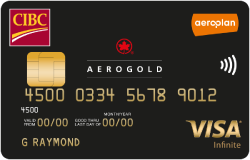 Note: At least 75% of the common carrier ticket must be charged to your card and/or using your Aeroplan Miles in order to be eligible for the benefits. Note: The maximum benefit payable to an insured person resulting from one accident, regardless of the number of losses, is limited to $500,000. If your rental vehicle is damaged or stolen while rented out in your name, you are covered up to the vehicle’s actual cash value plus valid loss of use charges (charges paid to the rental agency to compensate for the rental vehicle being made unavailable for rental while undergoing repairs) resulting from the damage or theft. You are covered under for any vehicle, in its model year, with a Manufacturer’s Suggested Retail Price (MSRP) under $65,000 (excluding all taxes), at the place the rental agreement is signed or where the rental vehicle is picked up. Check the rental vehicle carefully for scratches or dents before and after you rent the vehicle. Be sure to point out where the scratches or dents are located to a rental agency representative and have him or her note these on the appropriate form and retain a copy for your records. The rental agency may not classify vehicles, especially mini-vans, in the same way as this policy. Be sure to confirm with the company that your rental vehicle has coverage under this policy. Call the CIBC Credit Card Insurance Line at 1-866-363-3338 immediately to report the theft, loss or damage, and have a claim file opened. Your claim must be submitted with as much documentation as possible within 45 days of discovering the theft, loss or damage. This feature automatically, without registration, protects most new items purchased anywhere in the world against loss, theft or damage, for 90 days. If the item is lost, stolen or damaged, it will be replaced, repaired, or you will be reimbursed. Items are protected under this feature only when the full purchase price is charged to your card, and if they aren’t covered by other insurance. Note: There is a maximum aggregate lifetime benefit per Cardholder of $60,000 for claims under Purchase Security & Extended Warranty Protection Insurance for all of his or her CIBC Credit Cards. Note: Jewellery stolen from baggage not hand carried is not covered unless the Cardholder’s baggage is stolen in its entirety; in which case, the loss is subject to a limitation of $2,500 per incident. Call 1-866-363-3338 within 45 days from the date of the loss, theft or damage. You will be required to complete, sign and return a loss report within 90 days from the date of the loss, theft or damage. Note: You must obtain approval before proceeding with any repair services. This feature automatically, without registration, provides you with double the term of the manufacturer’s warranty up to a maximum of one year on most items purchased anywhere in the world when the full purchase price of the item is charged to your card. Items with warranties over five years can be covered if they're registered within the first year after they're purchased. If you have to cancel your trip before leaving your departure point because of an insured risk, then you'll be reimbursed up to $1,000 per person and up to $5,000 per trip for the non-refundable portion of your prepaid travel arrengements. The cardholder, his or her spouse and dependent children, as well as up to 2 travelling companions are all eligible to receive benefits under this insurance. The coverage period starts on the date that your trip is booked with a travel agent/supplier (and before any cancellation penalties have been incurred), and runs until your scheduled departure date. Cancel your trip and call the CIBC Credit Card Insurance Line at 1-866-363-3338 as soon as reasonably possible. You will be given all the information required to file a claim. Note: In the event of a medical cause for cancellation, you must give the insurer your consent to verify your health card number and other information required to process your claim. You must also give your authorization to doctors, hospitals and other medical providers to provide the insurer with any and all information they have regarding you, while under observation or treatment, including your medical history, diagnoses and test results. If, after you’ve already departed, your trip is unexpectedly cut short or delayed because of an insured risk, you’ll be reimbursed up to $2,000 per insured person for the non-refundable unused portion of your prepaid travel arrangements, transportation, and out-of-pocket expenses. When you or your travelling companion are hospitalized on your scheduled return date, your coverage will remain in force during the period of hospitalization and up to 5 days following discharge from the Hospital. Similarly, coverage is automatically extended for up to 5 days when you must delay your scheduled return date due to your or your travelling companion’s medical emergency. Coverage is also automatically extended for up to 72 hours when the delay of a common carrier in which you are a passenger causes your trip to extend beyond your scheduled return date. Your economy class one-way air fare via the most cost-effective route to your next destination (inbound and outbound) on your trip. You will also be reimbursed up to $100 per day per person (up to a maximum of $1,000 for all insured persons combined) for commercial accommodation, meals, telephone and taxi expenses if your trip is interrupted or, if return home is delayed beyond the scheduled return date. Note: Any transportation and out-of-pocket expenses benefits must be undertaken within 10 days following your originally scheduled return date if your delay is not the result of hospitalization, or within 30 days if it is. Call the CIBC Credit Card Insurance Line at 1-866-363-3338 as soon as reasonably possible to advise them of the interruption or delay. You will be given all the information required to file a claim. Note: In the event of a medical cause for interruption or delay, you must give the insurer your consent to verify your health card number and other information required to process your claim. You must also give your authorization to doctors, hospitals and other medical providers to provide the insurer with any and all information they have regarding you, while under observation or treatment, including your medical history, diagnoses and test results. In the event that your scheduled departure is delayed by more than 4 hours, causing you to miss a connecting flight or delay your travel arrangements, you will be reimbursed up to a maximum of $500 for reasonable living expenses (meals and accommodation) incurred while delayed. Additionally, if as a result of the delay, you either return directly to your principal residence, or you travel to a place of overnight accommodation, then you will be reimbursed up to $100 for ground transportation expenses. You will also be reimbursed up to $100 for entertainment expenses incurred if, as the result of the flight delay, you attend a ticketed event such as, but not limited to, a movie theatre, theatre, concert hall, opera or sports event. Call 1-866-363-3338. If possible, written notice of claim should be given within 90 days after the occurrence of any loss, and written proof of loss as soon as reasonably possible. In the event of a medical emergency taking place during a trip outside of your home province, you will be covered for any eligible emergency travel medical expenses incurred and will also have access to emergency medical and travel services. Call Global Excel at 1-877-350-6970 at the first available opportunity when you need emergency medical assistance. You must call Global Excel before obtaining any medical services or advice. The operator can direct you to a medical facility or doctor in your area of travel. Some treatments require pre-approval in order to be covered. If you contact Global Excel at the time of your emergency, it will ensure that your covered expenses are paid directly to the hospital or medical facility, where possible. You must submit your claim within 90 days of the date the service was provided. In the event that your checked baggage, or that of your spouse or dependent child, is permanently lost or damaged while in the custody of the common carrier, you will be reimbursed up to a maximum of $1,000 ($500 per person) for the replacement cost of any lost or stolen personal property that is not covered by other insurance. Note: You will only be reimbursed if at least 75% of the ticket price was charged to your card and/or was obtained using your Aeroplan Miles. If your checked baggage, or that of your spouse or dependent child, is unavoidably delayed for more than 6 hours while in the custody of an airline , you will be reimbursed up to a maximum of $1,000 ($500 per person) for the purchase of necessary clothing and personal hygiene articles during the delay period.